Now your hand can "feel" when your grip is correct. Ed's exclusive, deep-hold grip safety drops the gun farther into the hand plus, the three memory grooves on the lower portion guides the web of the hand into the correct grip position. Raised surface area helps depress the safety and ensure positive disengagement, even for a shooter that uses a high-thumb hold. SPECS: Matte finish. .878" (22.3mm) from rear of hole to tip. Clearanced for Commander hammer. Available in blue and stainless steel (S/S) to fit series 70 or 80. .250" (6.3mm) radius, requires alteration of frame. Nå kan hånden "føle" når din grep er riktig. EDS eksklusive, dyp-hold grep sikkerhet drops pistolen lenger inn i hånden, pluss tre minnet spor på den nedre del guider nettet av hånden i riktig grep stilling. Hevet overflate hjelper trykker sikkerheten og sikre positiv løsrivelse, selv etter en skytter som bruker en høy-thumb hold. Spesifikasjoner: matt finish.. 878"(22,3 mm) fra baksiden av hullet til spissen. Clearanced for Commander hammer. Tilgjengelig i blått og rustfritt stål (s/s) å passe serie 70 eller 80. . 250"(6.3 mm) radius, krever endring av ramme. this grip safety did require fitting obviously and it all works except it is cut to low to engage the firing pin safety in my kimber custom 2 i did no filing in this area and it is way too short to work my kimber is now a paper weight with this safety, granted a very nice looking one. These 80 series grip safeties work perfectly for colt style firing pin blocks. 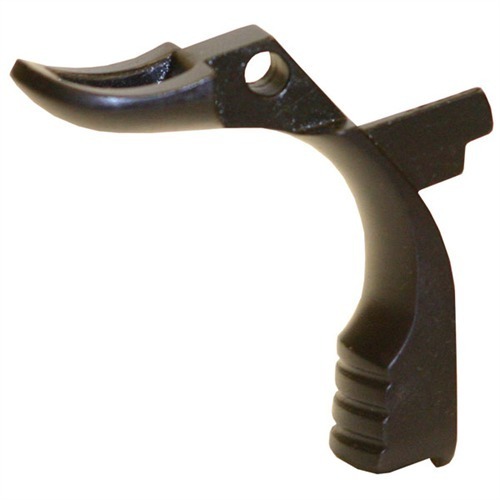 If your firearm has a Swartz safety (kimber series II) You NEED the 70 series grip safety. I recently purchased a Sigsauer Model 1911-22 brand new from a dealer. This handgun will take 80% of the parts made for a standard 1911 Model handgun, even though it is designed and produced as a .22 caliber firearm having a zinc frame and an aluminum slide. It takes the series 80 firing pin system. I thought it would be fun to replace the "plinking parts" that were a part of this handgun and replace them with "real" Model 1911 parts. Took care of the internal parts from a dealer specializing with high quality stainless steel parts specifically for this handgun. I decided to get a set of grips (Hogue dark earth finger grip rubber) and also a flat mainspring housing with a snakeskin surface in stainless steel and this Ed Brown grip safety in stainless steel. I have put grip safeties in other handguns for local folks, and they all required some fitting. This particular grip safety as noted here dropped right in! Fabulous! It is tight but it works safely and I am going to shoot the pistol some before I decide to loosen it up. This is the first grip safety I have installed that dropped in and functioned with no fitting at all! I couldn't believe this fit in my Metro Arms With no gunsmithing or Dremmeling. Great buy for any 1911 enthusiast. Excellent manufacturing. Doesn't quite fit flush like I wanted to fit. Bulges out just a little bit. Ok First off if you want a custom look you have to customize it, blend it. The review that says it bulges out,,well to acheave a custom look parts are oversized. I have fitted and blended these in several guns and when they are done right they blend like a champ. Dont expect the gun to blend itself. The memory groove works as it should. Great product. Required fitting .. I didnt use jig but probly wouldnt hurt .. I purchased one of these, and then exchanged it for a second that had the same problem. The lower palmswell portion is significantly out of square to the hole. The right side of mine hangs over the edge of the frame by about an 1/8" and there is a matching gap on the left side. No amount of "fitting" would correct this issue. 1/8" would need to be removed from the right side on the lower portion to make this approach functional. Even at that point, it would look like garbage. I would avoid this item completely. I expected a lot more from something with the Ed Brown name on it. Bought this for my GSG-1911 22, Great fit feels a 100% better that my Stock grip safety, Took a little Filing and fitting Works wonderfully in there now! I found the tab on the bottom of this grip safety isn't long enough to properly engage my factory mainspring housing and the grip safety would not block the trigger bow unless it was half way depressed. very good fit to grip and web of hand. Use 886 Ed Brown beavertail jig to gunsmith install...makes the job very fast and easy. No more 'web bites' on your hand with this beavertail. Super comfortable, easy to install (with the jig) far better than the standard A1 grip safety for a high thumbs grip. Recently istalled on my custom build to replace one I pulled out of the random parts bin. I love it. had to mill the frame a bit for smooth function but well worth the time. Produsentnr. : 8671 800732867014 Nå kan hånden "føle" når din grep er riktig. EDS eksklusive, dyp-hold grep sikkerhet drops pistolen lenger inn i hånden, pluss tre minnet spor på den nedre del guider nettet av hånden i riktig grep stilling. Hevet overflate hjelper trykker sikkerheten og sikre positiv løsrivelse, selv etter en skytter som bruker en høy-thumb hold. Produsentnr. : 867 800732867007 Nå kan hånden "føle" når din grep er riktig. EDS eksklusive, dyp-hold grep sikkerhet drops pistolen lenger inn i hånden, pluss tre minnet spor på den nedre del guider nettet av hånden i riktig grep stilling. Hevet overflate hjelper trykker sikkerheten og sikre positiv løsrivelse, selv etter en skytter som bruker en høy-thumb hold. Produsentnr. : 868 800732868004 Nå kan hånden "føle" når din grep er riktig. EDS eksklusive, dyp-hold grep sikkerhet drops pistolen lenger inn i hånden, pluss tre minnet spor på den nedre del guider nettet av hånden i riktig grep stilling. Hevet overflate hjelper trykker sikkerheten og sikre positiv løsrivelse, selv etter en skytter som bruker en høy-thumb hold. Produsentnr. : 8681 800732868011 Nå kan hånden "føle" når din grep er riktig. EDS eksklusive, dyp-hold grep sikkerhet drops pistolen lenger inn i hånden, pluss tre minnet spor på den nedre del guider nettet av hånden i riktig grep stilling. Hevet overflate hjelper trykker sikkerheten og sikre positiv løsrivelse, selv etter en skytter som bruker en høy-thumb hold.